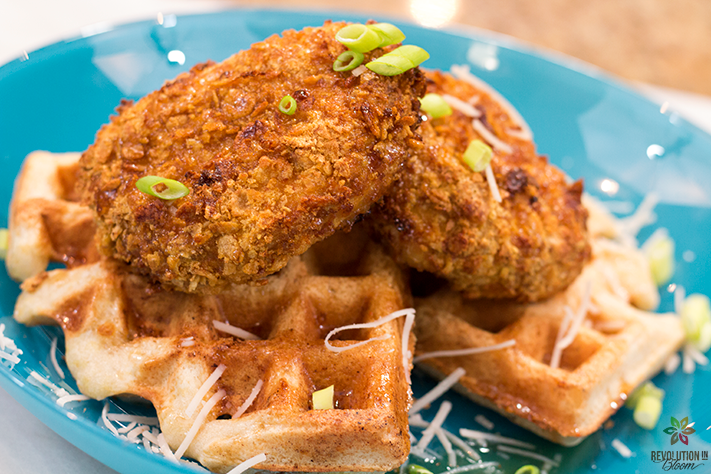 For soul-food enthusiasts across the US, chicken & waffles is a staple. Growing up in southern Florida and also traveling up to southern states like Georgia, I’ve had my fair share of chicken and waffles. I’ve personally always loved a sweet and savory combo on my plate and this dish doesn’t disappoint. It’s full of flavor from the crisp and savory vegan chick’n to the fluffy waffles topped with a kick’n bourbon maple butter sauce. I decided to air fry my chick’n, so it’s a bit healthier too. All around goodness! For the waffles in this recipe, I used a store bought vegan mix called Birch Benders Micro Pancakery but you could also make my homemade waffle recipe for this dish as well. I also used a store bought vegan meat for my chick’n. Today we are lucky to have plenty of vegan meats available on the market. I love using Gardein brand meats for most of my “meaty” dishes like this one. However, you could also use my seitan recipe for this dish or my crispy tempeh cutlets recipe. Both would be just as delicious in this dish. So, I hope hope you try out this recipe and share in this soul-food goodness asap! Vegan crispy chick'n and fluffy waffles topped with a bourbon maple butter sauce is your ticket to soul-food heaven! Begin making your waffles in a standard waffle maker. I used a store bought brand and followed the instructions to yield 4 waffles. You could also use ready made frozen waffles for this recipe. Next, prepare your chick'n by adding flour and milk to a shallow bowl and mixing it together. It should yield a thinned out pancake like batter that coats a spoon. Add more milk if needed. Then, stir in your onion and garlic powder, salt, and hot sauce into the batter. When well combined set aside. You can then add cornflakes to a large zip-lock bag and crush the flakes into a coarse meal with your hands or a rolling pin. Allow it to remain rather coarse and not a thin sand like consistency. Set your corn flakes aside. Now, take your defrosted chick'n and fold each scallopini in half. Press together so that it holds its shape. Then dunk each chick'n piece into your batter first and then add it to your bag of cornflakes. Coat each piece in cornflakes one at a time by shaking the battered chick'n in the bag. Make sure that your chick'n is evenly coated with your flakes. Set each piece aside. Add all of your chick'n to an air-fryer and set it to bake at 400 F for about 15-20 minutes or until evenly golden brown. Cook the same way in a standard oven by setting your oven to convection bake and placing your chick'n onto a baking tray lined with parchment paper or oil. While chick'n and waffles bake, you can begin making your sauce by adding your maple syrup and bourbon to a small sauce pot. Bring to a low boil and add in your butter and stir until fully melted. Then lower heat to medium low and stir in your cayenne pepper and salt. Cook for another 3 minutes and take off the heat to sit at room temperature. Once all of your ingredients are cooked, assemble your chick'n and waffles by placing two chick'n pieces over two waffles and topping with as much bourbon maple butter sauce as desired. You also have the option of topping your dish with green onions and vegan Parmesan cheese shreds. Serve immediately and ENJOY!